Through September 30, restaurant-goers are invited to ‘Chip in the Fight Against Cancer‘ at all Tijuana Flats locations. The initiative will benefit Florida Hospital for Children and the Breast Cancer Research Foundation (BCRF). The numbers are in, and this year’s Taste of the Nation raised an amazing $279,487 to help fight childhood hunger. 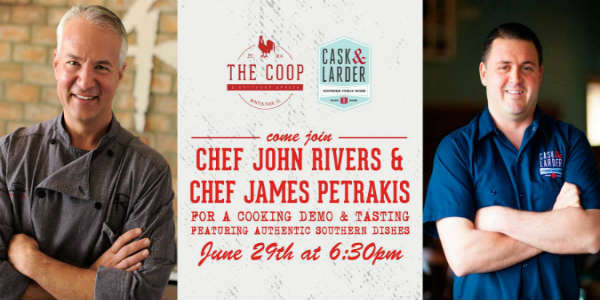 Special guest Chef James Petrakis of Cask & Larder will join Chef John Rivers for cooking demo and tasting at his restaurant, The COOP, on June 29. The event is free, and starts at 6:30pm (though I recommend arriving early). Visit the event’s Facebook page for more info. 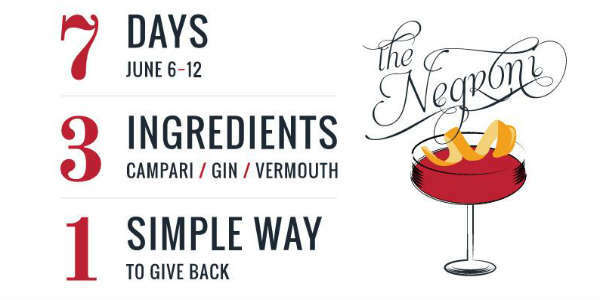 The 2016 Negroni Week charity event takes place from June 6-12, with over 30 participating Central Florida bars and restaurants. Negroni Week launched in 2013 as a celebration of one of the world’s great cocktails and an effort to raise money for charitable causes around the world. Seasons 52 menus change with the seasons, to better reflect foods that are in season. On a recent afternoon, Carol, our family writer, and I tried out their spring lunch menu at the Dr. Phillips location. We arrived shortly after they opened at 11:30am, so we were immediately seated for our reservation. After perusing the menu, we decided to order a few items and share. While we waited for our food, we took in the decor. Dark wood and plenty of skylights gave the room a upscale feel that wasn’t stuffy. The living trees and plants gave the main room an outdoorsy feel, as well. Classy but understated. Seasons 52 is known for their changing menu, which reflects foods that are in season, but one of the highlights of a recent visit was their new Mini Indulgences desserts. 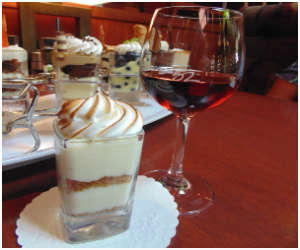 As the name implies, these desserts are tiny, served in a shot glass, but they are so full of flavor, you really don’t need a bigger size. In order to give a proper review, we did, of course, have to sample all nine flavors currently on the menu. When they arrived at the table, Carol and I decided to sample them in order of lightest to heaviest, to build up our taste buds. The Key Lime Meringue Pie featured a dollop of meringue on top of a key lime curd that was a perfect mixture of sweet and tart. It was layered with thin ribbons of graham cracker crust. 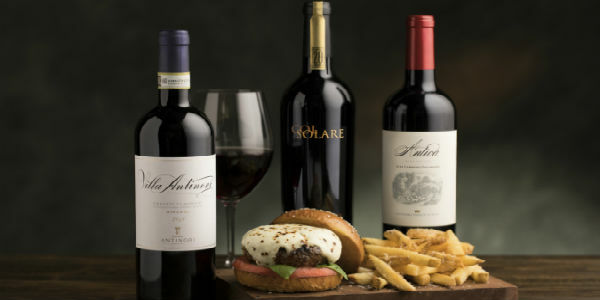 Seasons 52 has introduced a new seasonal menu for Fall 2013, including appetizers, entrees, side dishes and a signature Mini Indulgence. 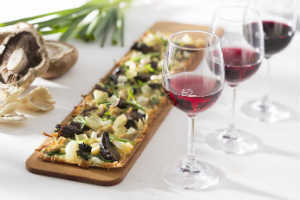 Roasted Mushroom Flatbread featuring black trumpet, oyster and Portobello varieties, complemented by a delicate garlic confit, spinach and green onions atop Seasons 52’s signature crisp flatbread. Lemongrass Steamed Black Mussels featuring Prince Edward Island mussels in a Thai green chile sauce, served with grilled sesame toast. Butternut Squash Soup topped with crisp shiitake mushrooms and chives. Manchester Farms Quail is stuffed with mushroom risotto, roasted to perfection in a brick oven then served with spinach, bacon and a sauce made with 15 year aged balsamic vinegar. Maple Glazed Roasted Half-Chicken featuring FreeBird Chicken served with roasted autumn vegetables, including carrots, parsnips and cippolini onions. Organic Baby Spinach Salad topped with Subarashii Kudamono Asian pears, toasted pine nuts and gorgonzola cheese. Brussels Sprouts roasted with garlic and topped with a parmesan-bacon crust. Pumpkin Pie Mini Indulgence with a ginger snap crust. In addition, Jolie Saison, a premium Gamay wine, has been added to the “Drink Them Before They’re Famous” wine list, which features insider wines that are on the verge of becoming highly rated and widely recognized. Master Sommelier George Miliotes traveled to France to create this exclusive, unparalleled blend with famed winemaker Georges Duboeuf. The restaurant changes its menu four times per year with weekly fresh features that capture the season. These items will be available until mid-December. Seasons 52 has two area locations: 463 E. Altamonte Dr in Altamonte Springs and 7700 W. Sand Lake Rd in Orlando. Seasons 52 has introduced a new seasonal menu for summer, including appetizers, entrees, side dishes and a signature Mini Indulgence. An Heirloom Tomato Carpaccio – Heirloom tomatoes finely sliced and gently tossed with extra virgin olive oil, crumbled goat cheese and fresh basil, and then drizzled with 15-year aged balsamic vinegar. Plainville Farms Turkey Skewer – The turkey is basted in a house-made Zinfandel barbecue sauce and grilled over wood-fire, then served on a bed of farro grain accented with grilled peppers, corn and green beans. 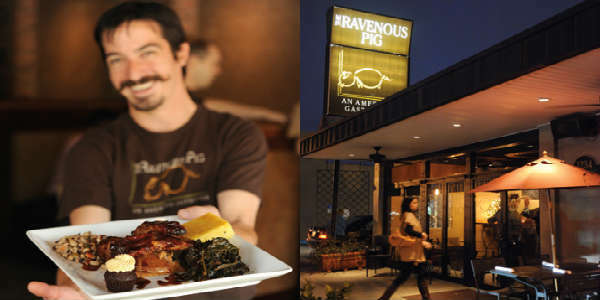 Fig and Goat Cheese Flatbread – Topped with Laura Chenel chevre, smoky bacon and aged balsamic vinegar. 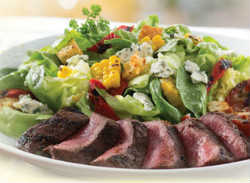 Grilled Flat Iron Steak Salad – Served with corn, plum tomatoes and blue cheese topped with a cumin-lime vinaigrette. Grilled Corn on the Cob – Topped with chili, lime and cilantro. Summer Berry Cheesecake Mini Indulgence – Cheesecake topped with fresh blueberries and raspberry and blueberry sauces.